In this new commentary on the controversial Gospel of Thomas, Simon Gathercole provides the most extensive analysis yet published of both the work as a whole and of the individual sayings contained in it. This commentary offers a fresh analysis of Thomas not from the perspective of form criticism and source criticism but seeks to elucidate the meaning of the work and its constituent elements in its second-century context. With its lucid discussion of the various controversial aspects of Thomas, and treatment of the various different scholarly views, this is a foundational work of reference for scholars not just of apocryphal Gospels, but also for New Testament scholars, Classicists and Patrologists. ... My book, The Inner Lives of Ancient Houses: An Archaeology of Dura-Europos is the first to consider the houses of the site as a whole. The Dura houses were excavated by a team from Yale in the 1920s and 1930s, and though a wealth of archaeological and textual material was recovered, most of that relating to housing was never published. Through a combination of archival information held at the Yale University Art Gallery and new fieldwork with the Mission Franco-Syrienne de Doura-Europos my book re-evaluates the houses of the site. Integrating architecture, artefacts, and textual evidence, this study examines ancient daily life and cultural interaction and includes a consideration of houses that were modified for use by the Roman military. The houses of Dura were, in some cases, occupied over several generations, so we have not only the evidence of their final form, but also of their use and adaptation over a long period. Houses were passed down within families, divided between kin, sold, left to become ruinous, or transformed into quarters for Roman soldiers. The houses were living structures, being constantly maintained and modified, and parts of their biographies can be traced in these architectural modifications. More from Dr. Baird on Dura Europos is here and links. And there's lots more on Dura Europos here, here, and, sadly, here and links. May I invite my readers to imagine what sort of money even a single mega-church could spend, if it was convinced that among the sands of Egypt were texts that would illuminate, or confirm, or illustrate, – whatever – the bible? It’s easy enough to sneer at enthusiastic amateurs talking about washing papyri with palmolive. There’s been plenty of that. It’s easy to jeer at famous apologist Josh McDowell and his promotion of the work. And yet … it’s shameful too. I welcome getting the public involved. I welcome enthusiasm, the wide diffusion of involvement, in a guided way. Archaeologists have managed this with aplomb for decades. They’ve even managed to get random metal-detectorists working with them, rather than against them. The result is that archaeology has a large constituency among the public willing to lobby for them. Times are hard, but they are well-placed. So, are archaeologists, as a breed, simply more intelligent than papyrologists? Really? For what kind of short-sighted idiot rushes to insult, to obstruct, to sneer, at the involvement of the public? Perhaps. But if the inferences about Hebrew diglossia in the Second Temple period are correct, Hebrew was probably also a widely spoken language, not just a scholarly one. (See discussion in yesterday's post here.) The article also quotes Jonathan Katz on whether Jesus knew Latin (unlikely) or Greek (probably some). See yesterday's post (linked to above) and links for more on this story. I have posted endlessly on Mel Gibson's movie The Passion of the Christ and its use of Aramaic (and the other languages). Many of the relevant posts are here, here, here (Latin too), here (Latin and Greek too), here, here, here, here, here (Latin too), here, here, here (Greek), here, here (Hebrew and Greek too), and here. And my review of the movie is here. Also, this seems relevant, sort of. We regret to announce that the Yeshiva University Dead Sea Scrolls Seminar that had been scheduled for 1-4 PM on Sunday, June 8, 2014 at the Yeshiva University Museum @ the Center for Jewish History in Manhattan has been canceled. It will be rescheduled for a date in the Fall term 2014. THIS WEEK'S DAF YOMI COLUMN BY ADAM KIRSCH IN TABLET: ‘Daf Yomi’: Talmudic Rabbinical Thought Was Part Lunatic, Part Moon Shot.Why gamblers, pigeon racers, and usurers can’t witness a Jewish new moon, and why the lunar calendar still matters. How often does a modern city-dweller think about the moon? Could you tell, without looking it up, what phase the moon is in tonight, or where it will appear in the sky at any given hour? Probably not, and why would you—for many of us today, the moon is just a big decoration in the sky, and the destination of some old Apollo missions. For the rabbis of the Talmud, however, the moon was the key to the whole rhythm of Jewish life. Because the Jewish calendar is a lunar calendar, with the beginning of the month tied to the appearance of the waxing crescent moon, the whole rabbinic and priestly establishment was highly attuned to the moon’s phases and trajectories. This week’s Daf Yomi reading, which included the end of Chapter 1 and all of the brief Chapter 2 of Tractate Rosh Hashanah, was all about the procedures for determining exactly when the waxing crescent moon appears. Mr. Kirsch does not mention the solar calendar, which is known from the Enochic literature and the Dead Sea Scrolls etc., and which was quite important to some Jews in the Second Temple period. Some posts relating to it are here, here, here, and here. While we're on the subject of the Moon: I've been looking for an excuse to mention this story, which has received a lot of coverage in the last couple of weeks: Sending a Torah to the moon. A company in Tel Aviv aims for cultural preservation by rocketing Torah scrolls to the moon for posterity (Jerusalem Post). Tel Aviv-based company Torah on the Moon was hoping to deposit Torah scrolls on the moon as part of a cultual preservation project in case something should happen to Earth, the Washington Post reported this week. Last week, the engineering arm of the European Space Agency confirmed that it has been commissioned to test the space-hardiness of the capsule that would contain the Torah, the Post reported. The capsule must be designed to protect the sacred text from the moon’s harsh radiation and temperature changes for at least 10,000 years. The moon lacks an atmosphere to trap heat, and the surface temperatures can rocket to a daytime high of about 253 degrees and plunge to 279 degrees below zero at night. There were separate plans in the works to carry Hindu scriptures called the Veda and the I Ching, an ancient Chinese philosophical work, to the moon if the Torah mission was successful. The texts would join a Bible left on the moon in 1971 by Apollo 15 commander David Scott. A common fallacy presents Hebrew usage in first century Judea and the Galilee as a strictly sacred, literary language, comparable to Latin in Medieval Europe. The notion that both Hebrew and Latin were monolithic is erroneous. During the Second Temple period, Hebrew had developed into two social dialects. The high register was a literary dialect used for prestigious communication, known today as “Late Biblical Hebrew,” the language of books like Ezra and Nehemia and much of the Qumran writings. 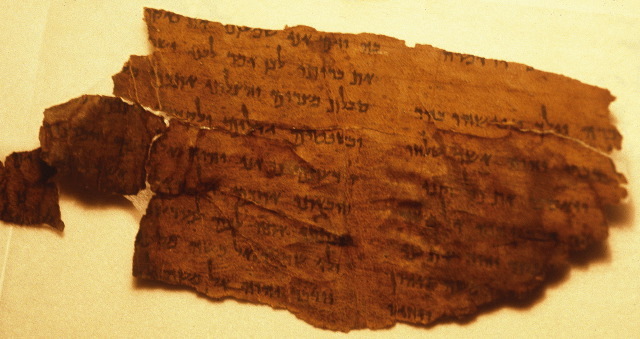 The low register can be seen in works like the Copper Scroll from Qumran Cave 3, and in various papyri, graffiti, and inscriptions from the Second Temple period, as well as the tannaitic and amoraic writings of rabbinic literature. Already in 1908, M.H. Segal had pointed out to the scholarly world that Mishnaic Hebrew showed the marks of the internal development of a colloquial language - it was definitely not an artificial usage by a scholarly elite. Secondly, it is argued that first century Judean and Galilean Jews needed a translation of the Hebrew Bible, the Aramaic Targums. The argument runs that the existence of the Aramaic Targums must mean that the people did not know Hebrew. However, the Targums served an interpretive interest beyond simple translation, a commentary that elucidated and expanded the plain text. Also, although many Aramaic writings are found among the Qumran community’s scrolls, except for the foreign (imported) Job and a potential text for a pilgrimage holiday, there is no Aramaic Bible. The Targum traditions that we have stem from the 2nd and 3rd century C.E. At this point in time, a widespread, first-century Aramaic Targum practice in Israel remains speculation and the evidence available, meager though it is, actually points away from such an assumption. Archaeology has also been heralded as decisive evidence in the Aramaic-only Jesus. According to Gilad: “In the Galilee, where Jesus lived, Aramaic had taken over by the time Jesus was born. In the south, in Judea, archaeological evidence shows that some pockets of Hebrew still remained during the first century C.E.” This is ironic. The real problem is that we have virtually no archaeological evidence for first century Semitic (Aramaic or Hebrew) languages in the Galilee. We do have Galilean names found in the south, and they are Hebrew! Dr. Buth is an expert Aramaist and his thoughts are always worth listening to. I think some of the arguments above are more persuasive than others. The last points out rightly that we have next to no direct information about the languages spoken in the Galilee in the first century. But this point applies to the argument about parables. The language pattern of parables in the much later rabbinic texts doesn't necessarily tell us anything about the language Jesus used to tell parables in the first century. If the book of Job had a foreign origin, this would scarcely have been important in the first century or a reason to make a Targum of it and not other books. I suppose one could say that the Hebrew of Job is just really difficult and that could make a Targum desirable — but why an Aramaic translation rather than just a paraphrase into easier Hebrew? Also 4Q156 preserves fragments of what looks like a Targum to the book of Leviticus, although this is debated. I would say that the Targum of Job does at least hint that there were elements of the population who were more comfortable studying the Bible in Aramaic than in Hebrew. The strongest argument is the evidence for diglossia (the presence of a high-class literary dialect and a colloquial dialect) in Hebrew going all the way back to the Hebrew Bible, and I should have taken this into account in my earlier comments. Most of the Bible is written in the literary dialect, whereas Mishnaic Hebrew is the colloquial dialect now raised to literary status. It is an inference, but a persuasive one, that Hebrew continued to be spoken in the Second Temple period and that the Mishnah adopted this spoken dialect for literary use. Who exactly continued to speak Hebrew (Judeans? Galileans? Both? At what social level?) is perhaps not entirely clear, but this does offer some good additional evidence that Jesus spoke both Aramaic and Hebrew. For more on diglossia, see Gary A. Rendsburg, Diglossia in Ancient Hebrew (New Haven, CT: American Oriental Society, 1990). THE CURRENT BIBLICAL STUDIES CARNIVAL has been posted on Jeff Carter's blog. HT James McGrath, who adds some posts on Christology to the list. LIV INGEBORG LIED: Transmission, textual units, "codex context." This post offers some methodological and theoretical reflections on the transmission of textual units, the transformation of texts, and some interesting challenges for those of us who work on "the codex context" - inspired by Brock and van Rompay's new catalogue. This is my final post on the catalogue of Syriac manuscripts in the Dayr al-Suryan. Promise. We'll forgive you if you change your mind, Liv. More from Professor Lied on that catalogue of Syriac manuscripts from the Monastery at Deir al-Surian is noted here and links. Her current post also has more on the title of Josephus' Antiquities book 6 (a.k.a. "5 Maccabees") in Codex Ambrosius B.21. Jobar Synagogue destroyed — again? THE DAILY BEAST REPORTS: Exclusive Photos: Syria’s Oldest Synagogue, Destroyed by Assad (Josh Rogin). The Jobar Synagogue was one of the holiest Jewish sites in Syria and contained priceless historical artifacts. Now it’s destroyed—and the opposition says Assad is to blame. Syrian Arab Army forces flattened the Eliyahu Hanabi Synagogue in the Jobar neighborhood of Damascus over the weekend. The attack not only wrecked a site that’s at least 400 years old. It may have destroyed thousands of irreplaceable Jewish artifacts contained inside the synagogue, according to opposition leaders and photos obtained at the site. I've held off on this one, because in March 2013 the synagogue was reported destroyed, but it developed shortly afterwards that it had been damaged but not destroyed (see here and here). This report came out on 27 May (a week ago) and was taken up in many places in the following day, but I cannot find any news after that. The photos of the damage look pretty comprehensive and, sadly, it appears that the report of the synagogue's destruction are true this time around. IN ST. LOUIS: Legal Conference on Talmud and Law to Celebrate 20 Successful Years. St. Louis, MO - On Thursday evening, June 12, attorneys and community members will gather at “The Jewish Law & Ethics Symposium”, a forum comparing Jewish legal and ethical principles with contemporary law and public policy, at the Sheraton Clayton Plaza Hotel. THE FESTIVAL OF SHAVUOT (Weeks, Pentecost) begins today at sundown. Best wishes to all those celebrating. Some biblical background is noted here. STARTS TODAY: The St Andrews Symposium for Biblical and Early Christian Studies. Hefsek and the gender of God. Or not. PHILOLOGOS: Why God Can Sometimes Sound Female. It's a Question of Grammar, Not Theology. Irving Salzman has a question about an ancient Hebrew prayer, the answer to which involves some fine points of linguistic history that may not interest everyone. Yet since the prayer is one that all of you who are synagogue-goers know and may have wondered about, too, I’ll risk discussing it. Given the preoccupations of many contemporary American rabbis, I’m surprised that none has tried telling Mr. Salzman that here is proof that the God of Judaism is also female — but even our rabbis, it would seem, know better than to confuse grammar with theology. The real answer to Mr. Salzman’s question lies in a feature of biblical grammar known as hefsek or “stoppage,” which ordains that certain Hebrew words change their vowels when occurring at the end of a sentence or phrase. This is a creative way of backing into the grammatical arcana of Hebrew pausal forms. THE LOD MOSAIC goes on display at Waddesdon Manor in Buckinghamshire, England, on Thursday. The Guardian has an article on it in anticipation by Christopher Lightfoot: The Lod mosaics – a carnival of animals. Much background here and links. Dr. Eilat Mazar, an Israeli archaeologist at the Hebrew University of Jerusalem, is a member of the Public Committee Against the Destruction of Antiquities on the Temple Mount. She said that in the large space underneath the Golden Gate there continues to be "significant, new activity that arouses great concern." The Israel Antiquities Authority has said that there is nothing new to report. The space underneath the gate has only seen limited educational activity by Muslims, with no harm done to antiquities there. The area in question was once used by the Islamic Movement and Sheikh Raed Salah, but it was sealed off by order of the military a decade ago. In recent years, there have been educational activities by Muslims. In recent months, however, Mazar said that "the area has been renovated, new lighting has been installed, carpets have been laid down there, and Muslim guards have prevented anyone from gaining access or coming close to the area." "The Muslims are gradually turning the place into a mosque and are in essence monopolizing the area for Muslim use only," she said. "This is a very serious development, even if this is being done with authorization. It is even graver if it is being done without authorization." The Antiquities Authority does not share the committee members' view. Authority officials view the situation in a different light. Dr. Yuval Baruch, the director of the Antiquities Authority's Jerusalem District, said that the area in question is being used to administer high school matriculation exams to students enrolled at schools that use the Temple Mount complex. The activities currently taking place there are permissible according to the closure edict that was issued years ago. "We visit the area on a regular basis," he said. "There is no change. There is no construction work being done, and there is no harm being done to artifacts." The article also mentions the 2010 State Comptroller's report on the Temple Mount, which has never been fully published, but its full text was reportedly leaked by the Jewish Voice last year.